We rarely value things we wish to eliminate, like the wait time our call center customers must endure before getting connected to a live agent. However, this is a major mistake. Even as we try to reduce queue time, we must, as good managers, consider ways to optimize use of the wait time we can’t eliminate. By optimization, I mean finding ways to enhance 1) branding, 2) loyalty and 3) profits for your company. Consider the fact that caller wait time is time customers are already dedicating to you. You have their undivided attention and can choose to waste it, or to maximize it for both your benefits. As a good manager, what are you choosing to do? If you are among the many who simply have a boring message or muzak on your IVR, you should reconsider your approach now. Optimizing queue time in term of branding your company. The combination of carefully selected music, voice talent and messaging can be analyzed and chosen to create the emotional response you wish to have associated with your brand. Providing opportunities for cross selling your own offerings in a way that will be appreciated, not resented, by the customer. Providing opportunities for revenues from third parties. For example, an appropriate offer to send a discount coupon for a partner company via SMS can earn you money from the partner, making your contact center a source for new profits. Providing public service announcements of a sort that support your brands. For example, mentioning a walkathon your company is sponsoring for a cause that resonates with your customer base will help build loyalty and goodwill. The point is not that you must leverage any one of these opportunities. Rather, you should consider all of them, along with your colleagues, and determine how to optimize their use to achieve your marketing and financial objectives. This becomes more targeted and powerful when you leverage CallSpace’s capacity to connect to your CRM database (and other databases), and add AI capabilities to determine which of the available options you should offer to a specific caller. The power of AI and machine, coupled with CallSpace, to customize value-enhancing customer experiences is formidable. Forward-thinking managers won’t want to miss out on this new capability. 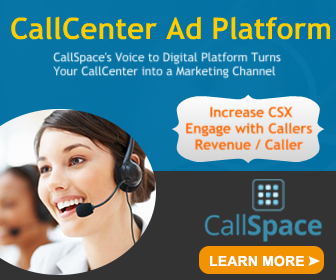 Bruce Belfiore, CEO of BenchmarkPortal, also acts as advisor to CallSpace, Inc.